6 Beautiful Tourist Attractions in Port Elizabeth, South Africa. Posted by Roy says.... on Sat November 22, 2014 in Events in Port Elizabeth . Port Elizabeth City Hall is located at the market square, the city's historic district, a building designed with a colonial style. At the top of this building there is a large clock installed in 1883, several decades after the founding of the building (between the years 1858 to 1862). The building was inaugurated as a national monument in 1973 this is council house and lecture halls / concert hall. Port Elizabeth city hall is open every day and only charge a fee to get in on certain events. Bell tower is located on Strand Road has become a landmark Port Elizabeth. Tower built in 1923 was established to commemorate the first settlers of this town. At the height of 52 meter high building, you can see beautiful views of the city. If possible, you can visit when the bell rang. The bell tower is open from Tuesday-Sunday from 9:00 to 14:00 pm local time and you are expected to give a donation if you visit here. The most prominent feature on Port Elizabeth's shoreline besides the harbours, Shark Rock Pier is the only pier in the city. Located between Hobie Beach and the Red Windmill the pier is at the very centre of the Port Elizabeth beachfront and is a major landmark and drawcard. The building of the pier was actually responsible for the creation of Hobie Beach as it is to-day by impeding the tidal drift of sand northwards and causing it to build up. A double benefit to the city. Enjoy the views of this stylish pier from various points along the shore and the views of the city and the bay from the pier itself. St George's Park, is the oldest park in Port Elizabeth and is situated within walking distance of the city centre. Established in 1860, St George’s Park is spread over 73 ha. of pristine wooded parkland and comprise extensive plant collections and specimen trees. The Park incorporates the world famous Port Elizabeth Cricket Club; the founder cricket club in South Africa. 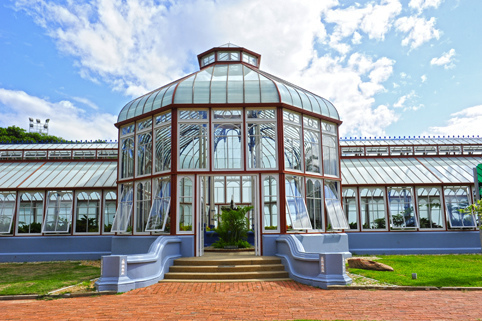 The oldest bowling green in South Africa (named "Founders Green"); the St. George's Park Swimming Pool; Prince Alfred's Guard Memorial as well as the 1882 Victorian Pearson Conservatory which was built for the cultivation of exotic plants, water lilies and beautiful orchids, are also situated in the Park. Other facilities include a children’s playground. The park is also a favorite for jogging enthusiasts and, on the last Sunday of each month, comes alive with a large concentration of art and craft stalls for the monthly Art in the Park event. The MBDA’s Route 67 consists of 67 Public Art Works symbolising Nelson Mandela’s 67 years of work dedicated to the Freedom of South Africa and includes 67 steps leading up the second largest flag in Africa. The artworks were designed by local artists from the Eastern Cape. The route is proud celebration of our cities heritage and history. This is a must see stop for the whole family to walk and to enjoy. The Route 67 starts at the Campanile and climbs the staircase to Vuyisile Mini Market Square which is the centre of the City.